Gaerne motorcycle boots women Black Rose Gore-Tex. 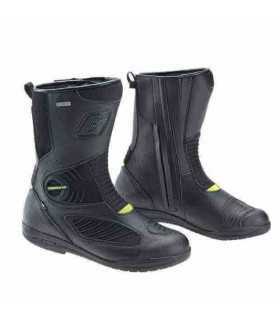 Gaerne motorcycle boots women Black Rose Gore-Tex. The first ?ladies only? boots with a fashion look designed according to the specific anatomy of the female foot, with special attention to the metatarsals and heels, it guarantees a perfect fit. Full-grain leather on the upper part and elastic cordura inserts. It is completely waterproof . A pro-tech ankle shield system in the ankle area and an easy-on side closure.